What Does Primary Fifth Wave Mean to S&P 500? The powerful rebound since mid October has pushed the S&P 500 index into the primary fifth wave which is the final upward leg of the multi-year-long bull market started from 2009. This primary fifth wave sets potentially another major upward move for the stock market from the October low in 2014 to the pre-election year high in 2015. Still, there will be a possible consolidation on the S&P 500 index as the momentum is weakening. The broad stock market is projected to stay in a short-term neutral time-window until 11/28/2014. A bullish breakout from a multimonth descending broadening wedge pattern is emerging on gold, silver, and their mining stocks although their trend is bearish. The following table is the percentage change of sectors and major market indexes against the 89-day exponential moving average (EMA89). The Wilshire 5000 index, as an average or a benchmark of the total market, is 4.04% above the EMA89. Outperforming sectors are Home Construction (10.39%), Biotech (7.75), and Semiconductor (7.02%). Underperforming sectors are Precious Metals (-9.35%), Oil Equipment (-3.88%), and Energy (-2.09%). The powerful rebound since the October low has kept making new highs. This is a strong sign that the S&P 500 index has resumed its primary uptrend. Therefore, from now on, we focus on only the second scenario which was discussed last several weeks. From late July to mid October, the S&P 500 index went through primary wave  in a pattern of a Expanded Flat Correction with intermediate (A)–(B)–(C) corrective waves. Upward wave (B) went up beyond the beginning of wave (A), and downward wave (C) finished beyond the end of wave (A). Primary corrective wave  ended as the expanded flat correction finished. Now primary impulse wave  have started with intermediate upward wave (1). This scenario can stand only if next downward wave (2) does not retrace all way back below 1820. As illustrated in the chart below, ideally primary wave  contains an intermediate (1)–(2)–(3)–(4)–(5) sub-wave structure. This fifth primary wave will be the final upward leg of the entail bull market started from 2009, and this final leg can last several months which begins from mid October of this year and ends sometime in 2015. Currently we approach the end of intermediate wave (1) inside primary wave . After intermediate wave (1) completes, we will get a projected price target for primary wave  based on the final height of current wave (1). In the following weekly chart, the German DAX index has completed primary corrective wave  as intermediate downward wave (C) ended. Now it is in primary impulse wave  with intermediate upward wave (1). Since March of this year, the Bombay index has been in the Bump phase with a sharp trendline as excessive speculation drives prices up steeply. The index maintained above the 2nd Parallel Line. The uptrend continues as long as prices stay above the Bump Trendline. This year the Chinese stock market gradually phased out its years-long bear market after it completed a 5-year “Ending Diagonal” pattern. A new bull market likely just started. The Shanghai Stock Exchange Composite Index is in primary wave . Recently the index reached our upside price target 2460. The 2460 level becomes a resistance, and prices could pull back from this resistance level. Now a 3-year horizontal trading range is forming between 2000 and 2460. Prices are testing the upper boundary of the range. The index is neutral before its next breakout. The table below is the percentage change of major global stock market indexes against the 89-day exponential moving average (EMA89). Currently Japanese market is outperforming. The Russian market is underperforming. In the following weekly chart, the U.S. dollar broke above the upper boundary of the 3-year ascending broadening triangle pattern. Based on Bulkowski’s measure rule on an upward breakout of ascending broadening triangles, the upside price target is projected at 92.4. The following chart is a daily chart of the 30-year U.S. treasury bond index. The index has formed a 10-month bullish uptrend channel. Now it is near the upper boundary of the channel. It would be bullish as long as prices stay above the lower boundary of the channel. The following chart shows that the gold index formed a 4-month descending broadening wedge pattern. Recently prices bounced off the lower boundary of the wedge. This is potentially a bullish reversal pattern although the trend is bearish. The silver index has also formed a 4-month descending broadening wedge pattern. Recently prices bounced off the lower boundary of the wedge, and now are going to test the upper boundary. This is potentially a bullish reversal pattern although the trend is bearish. 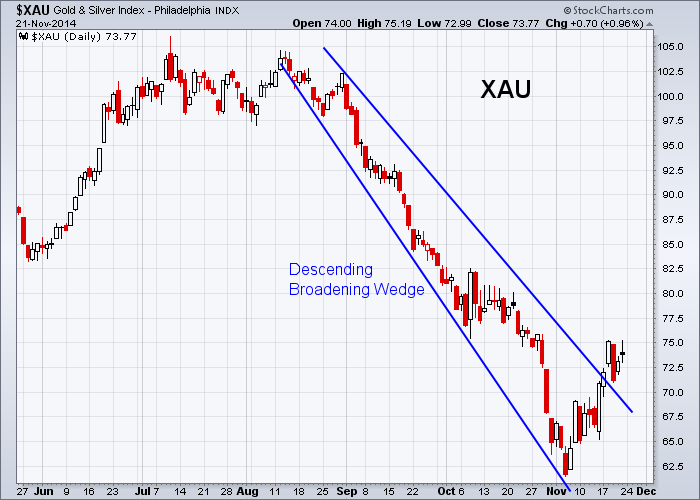 Gold/silver mining stocks formed a 3-month descending broadening wedge pattern. This is potentially a bullish reversal pattern although the trend is bearish. Last week prices broke above the upper boundary of the wedge. Based on Bulkowski’s measure rule on an upward breakout of descending broadening wedges, the upside price target is projected at 101.6. The GDX Market Vectors Gold Miners ETF formed a 3-month descending broadening wedge pattern. This is potentially a bullish reversal pattern although the trend is bearish. Last week prices broke above the upper boundary of the wedge. Based on Bulkowski’s measure rule on an upward breakout of descending broadening wedges, the upside price target is projected at 27.3. Crude oil is forming a 5-month Bump and Run Reversal Bottom pattern. Since October its decline has accelerated along the Bump Trendline, and reached a bump low with twice the lead-in height. Recently prices stayed above the second parallel line, and last week prices broke above the bump trendline. This should be an early reversal sign.